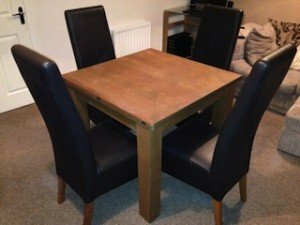 A solid wood square dining table, together with four matching high back dining chairs, upholstered in black faux leather. 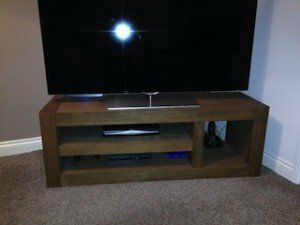 A 55 inch Samsung flat screen HD television, together with a solid oak television unit. 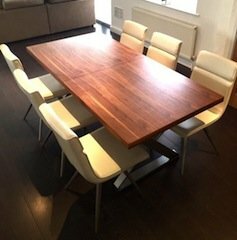 A solid wood extendable dining table on a chrome base, together with six low back dining chairs, upholstered in cream faux leather. 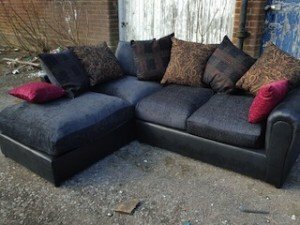 A four seater low back corner sofa, upholstered in black faux leather and dark grey velour. 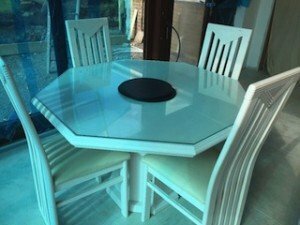 A white solid wood glass topped hexagonal dining table, together with four high back dining chairs, upholstered to the seat in cream leather. 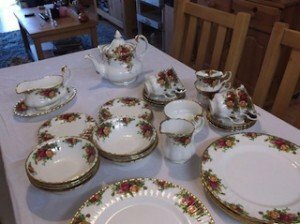 A Royal Albert floral and gold decorated porcelain tea service, includes a teapot, a milk jug, teacups, saucers, bowls, side plates etc. 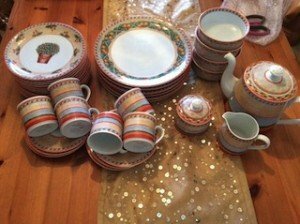 A blue and orange fruit patterned dinner set, includes six mugs and six saucers, a lidded sugar bowl, side plates, a teapot, dinner plates and bowls. 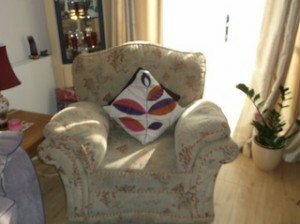 A vintage high back gentleman’s armchair, upholstered in floral patterned camel fabric. 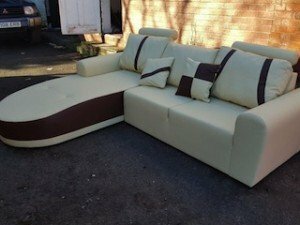 A large four seater low back corner sofa, upholstered in chocolate brown faux leather and camel corded velour. 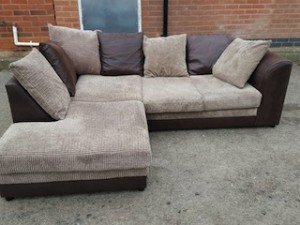 A five seater contemporary low back corner sofa, upholstered in black and white faux leather. 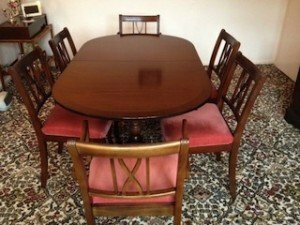 A vintage mahogany extendable oval dining table, together with six matching low back dining chairs, upholstered to the seats in salmon velour. 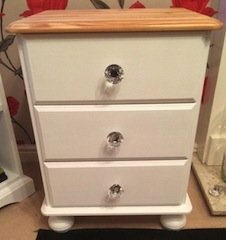 A hand painted white chest of solid wood drawers in the shabby chic style, each drawer having large crystal knobs, on ball feet. 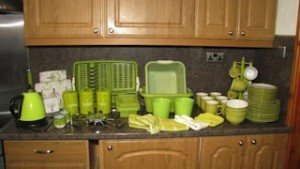 A large collection of lime green kitchen accessories, to include a kettle, a cutlery drawer, tea towels, a kitchen roll holder, a wall clock, tea, coffee and sugar canisters, etc. 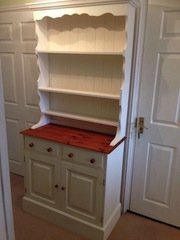 A white painted solid pine kitchen dresser, having three shelves above a counter top and two drawers above a double cupboard. 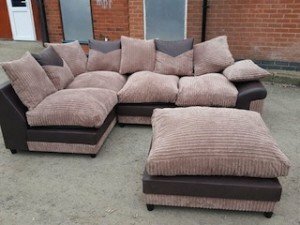 A four seater low back corner sofa and matching footstool, upholstered in chocolate brown faux leather and light brown cord velour. 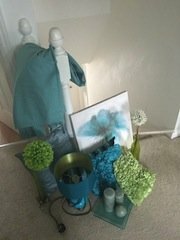 A collection of green and teal home accessories, to include a floral wall canvas, a table lamp, a candle tray with three candles, cushions etc. 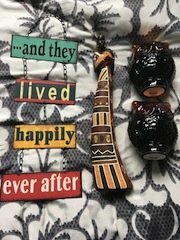 A small collection of home accessories, to include two owl shaped glass candle holders, a tall standing African statue and a wall plaque. 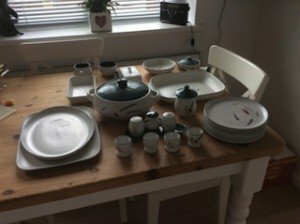 A Denby leaf and rye patterned ceramic dinner ware set, to include a large lidded casserole dish, four egg cups, salt and paper shakers, a lidded sugar bowl etc. 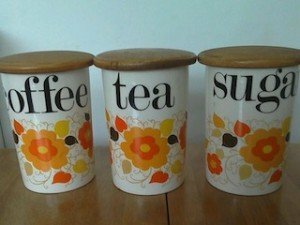 A set of crown Devon ceramic and wood, tea, coffee and sugar canisters, decorated with a floral pattern. 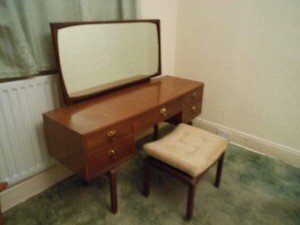 A vintage G plan vanity dresser and stool with a large removable mirror, having two drawers to each side of one central drawer.